When the authors of The Unofficial Man Men Cookbook extended an invitation to toast the Mad Men Season Finale at their Mad Men Blogger Virtual Dinner Party, I almost skipped reading the rest of the email because, well, I had never seen Mad Men. Then I discovered I can stream the episodes on Netflix. Sweet. So, over the course of several weeks, my husband and I knocked out five seasons! We're still plugging away on the sixth. But this cookbook by Judy Gelman and Peter Zheutlin - below along with the seasons on DVD - inspired me to host a Mad Men-themed Party for one of my best friend's 42nd birthday celebration. Along with another friend, who borrowed the cookbook to pick some recipes, we whipped up Sterling Cooper Blini and Caviar, Classic Shrimp Cocktail, Jackie Kennedy's Avocado and Crabmeat Mimosa, Betty's Swedish Meatballs, and Trudy's Ribeye in the Pan. We planned on letting the kids try the Popcorn Balls, but my air-popper decided to poop out that evening. Boo. However, the kids really enjoyed eating the marshmallows by the handful. The two recipes I'll share today have special meaning to me...and the birthday girl. At least this first one does. The second? Well, it's not a celebration without some festive libations. I have been friends with Jenn since we were in high school. And while most teenagers were probably out on dates on a Friday night, you could usually find me and Jenn at home. 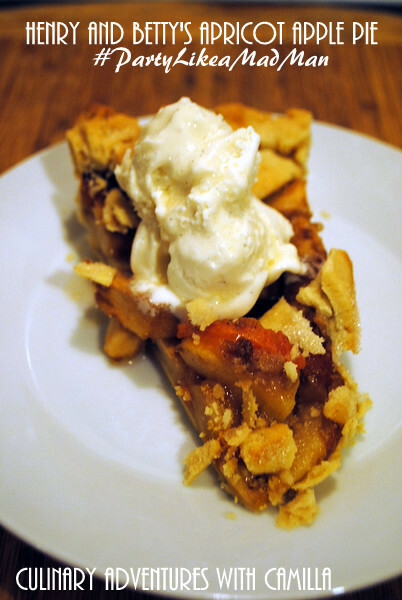 Most Friday evenings, we'd have dinner, bake an apple pie, and watch movies. Yes, we were hell-raisers, weren't we? Apple pie and movies...I can only hope that when my boys are teenagers, that will appeal to them. I'm not too hopeful, but maybe I'll entice them with some really awesome pie! I used my own crust recipe, spiked with a little booze; but I (mostly) followed the recipe for the filling. I did reduce the sugar a bit and added a few more spices. I would never have thought to add apricots to an apple pie. And, when it came to serving, everyone opted for ice cream - versus cheddar cheese. For the grown-ups, I upped the ante even more by drizzling the entire thing with an ice cider. Delish! Place the butter cubes, flour, sugar, and ground almonds in a large mixing bowl. I used to use a pastry cutter, but after watching a pastry chef, I have started pressing the butter by hand. Flatten the butter by hand into leaves, blending it in to the flour. Add in the water and whiskey and press the dough together till it comes together into a ball. Wrap the dough in plastic and refrigerate for at least 30 minutes. Roll the dough out between 2 pieces of parchment paper. Transfer the crust to a pie pan. Trim to the correct size. Crimp the edges and prick the crust with a fork. Place the crust in the freezer to chill while you preheat the oven and prepare the filling. Refrigerate any remaining dough for the top of the pie. Place dried apricots in a small saucepan, covered with water. Cook over medium heat until softened, approximately 15 minutes. Remove from heat and drain. In a large mixing bowl, toss the apples and apricots with flour, sugar, spices, and lemon juice. Spoon the mixture into the prepared crust and dot with butter. If you had extra dough, roll it out and cut it into strips. Form a lattice over the top of the fruit. Preheat the oven to 425°F. Bake the pie for 15 minutes, then lower the temperature to 375°F and bake for an additional 40 to 45 minutes - until the crust is crisp and golden. Let cool for 10 minutes before slicing. Serve with melted cheese or ice cream. I skipped the sugar completely, but added a little sweetness with a ginger syrup. If you don't want the ginger flavor, use a simple syrup instead. And I upped the lemon juice for a bigger pucker factor. For us the maraschino cherries were not optional; they were mandatory. 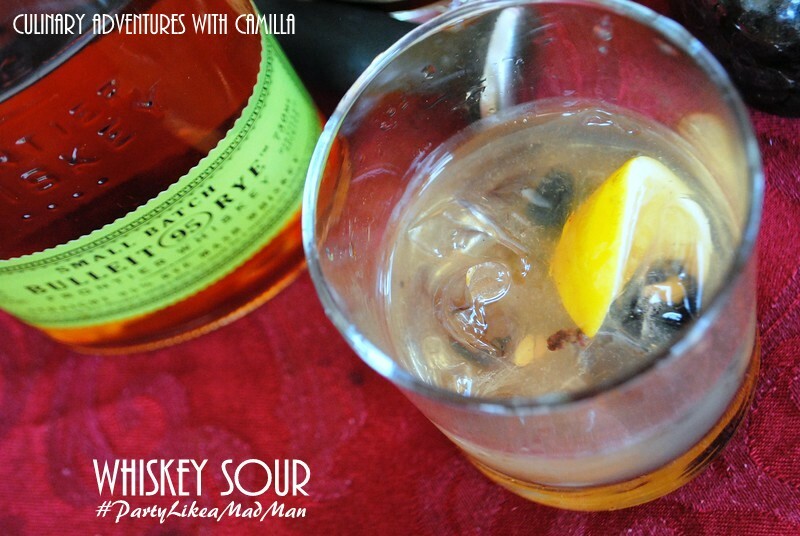 And, in a few drinks, we plunked in some boozy blueberries, too. Add whiskey, lemon juice, ginger syrup, and ice cubes to a cocktail strainer. Shake well. Strain into a prechilled class. Garnish with a lemon wedge and cherries. What a FUN, FUN party. 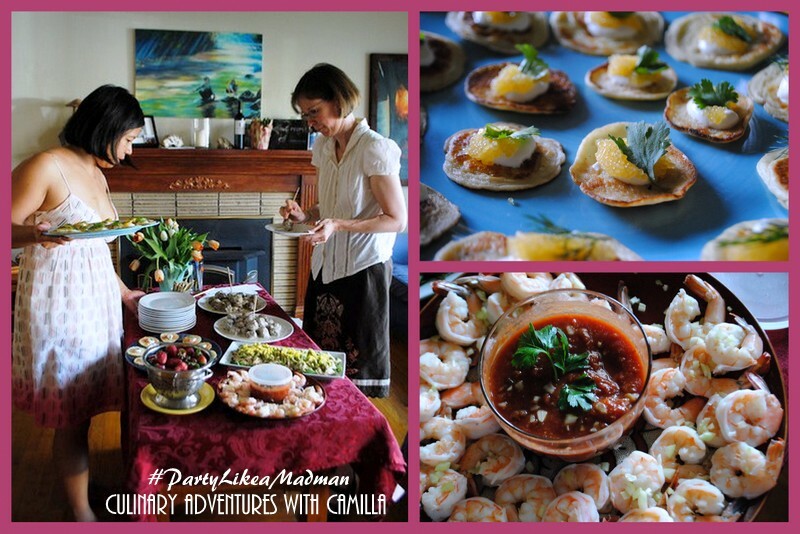 I can't wait to see what the other bloggers did to #PartyLikeaMadMan. Thanks, Judy and Peter, for the fantastic, easy-to-follow recipes. Our nibbles and sips were amazing. Jenn felt very celebrated...and we were all happily stuffed and sauced. Below are affiliate links to amazon for the cookbook and the seasons on DVD. I have never seen Mad Men either.